Our scientific world view is built on the concept of cause and effect. As a culture we often doubt anything that we can not verify. 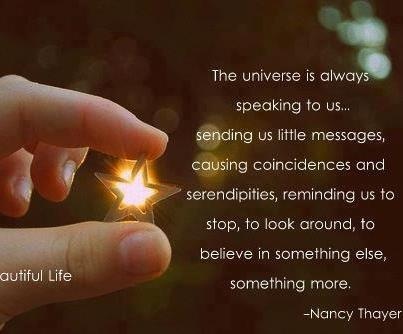 When events happen in startling ways, we hear ourselves saying, ‘it is just coincidence’. The notion that everything has an explanation is so programmed in our Western mentality. If it wasn’t for the courage of Carl Jung, synchronicity might not be so understood even today. Jung’s definition – Synchronicity is the coming together of inner and outer events in a way that cannot be explained by case and effect and that is meaningful to the observer. We experience synchronicity most often when we are open and aware. Special circumstances, challenges and times of upheaval are the outer conditions that push us toward openness, as the earth below our feet begins to shift, our Soul begins to awaken and we begin to feel more vulnerable. When our awareness is heightened during times of turmoil and change, we find ourselves hunting for answers and solutions, or perhaps it is just learning how to appreciate unexpected happiness. Synchronicity presents itself in many ways. It can be dramatic or subtle. Not always do we understand what it means or the message it contains right away, it could take days or months. What is magical about synchronicity is that it can change your life forever, the magic is in the evolution of your Soul, if you trust enough to see and listen to the messages. Synchronicity can happen one after the other, it is as if there is a point the Universe is trying to make over and over again. Depending on what you are going through in your life at the time, it could have all kinds of incredible meanings. The more deeply you come to understand synchronicity, the more you will be able to see the beautiful ways in which the Universe is whispering to you. Fully coming to understand and decode synchronicity prepares you to recognize what the Universe is trying to manifest for you. Listen to your gut feelings, if there is some unusual situation or circumstance that shows itself to you, don’t discount that it might have something interesting to offer you. Something that could very well provide a much needed answer to a question or query.